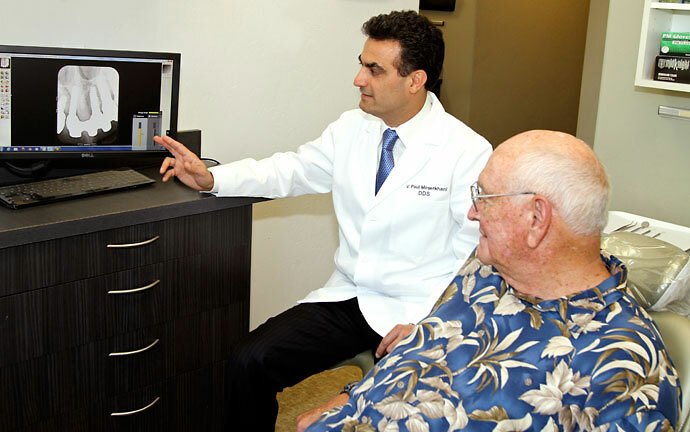 Dr. Messerkhani does full mouth reconstructions for patients who need extensive treatment. Traditional Dentures. While denture technology has improved, there are still drawbacks to conventional dentures including slippage and poor chewing ability. 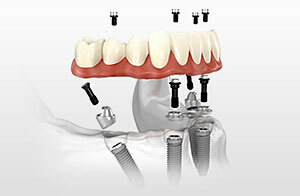 Implant-Supported Dentures. This treatment option prevents slippage and offers superior chewing ability. Implant-Supported Bridges. A permanently fixed set of porcelain teeth supported by implants. This is the most stable and natural-looking and acting of the treatment options. 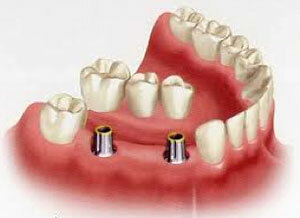 Fixed Implant-Supported Dentures. A fixed set of dentures that can only be removed by the dentist. All teeth replaced with implants. Less common is the replacement of a full arch (upper or lower jaw) of teeth with all implants. We will recommend the treatment options best suited to your dental needs. We take into account various factors. These include periodontal (gum) health, the bite—how the upper and lower arches fit together, the position of the various associated structures (nerves, sinuses) and the state of the bone in the jaws. When your treatment plan involves implants, the key to success is thorough planning. This will ensure your new smile is fully functional, healthy and pain-free, as well as aesthetic. Implant planning includes utilizing advanced 3D imaging by our dental implant specialists, who have over 50 years of combined experience in implant planning, placement and restoration. One of our dental implant specialists—Dr. Henriod or Dr. Meserkhani, conducts a comprehensive consultation in which they get the basic information needed to formulate a treatment plan with several options, and to discuss the patient’s goals and answer any questions. The best time to place implants is often when you have teeth extracted. This is because your jawbone may still be in good enough shape to receive the implants right away. The removal or loss of teeth leads to bone loss which causes your jawbone to shrink. But by placing implants immediately, your jawbone does not have the opportunity to shrink. Immediate placement saves you from having to undergo future bone grafting or experiencing other complications, like collapsing face structure. Here at Rancho San Diego Dental we use a combination of traditional surgery, high technology and lasers to deliver exceptional results. We can even create in our in-house lab the artificial tooth that connects to the dental implant. Our highly experienced team of dental specialists has placed thousands dental implants over the years and has a very solid greater than 98% success rate! Dentures can be supported by implants for greater stability. An implant-supported denture is a denture that’s been fitted with clips that simply snap onto implants placed in your jawbone, thus stabilizing it. A denture can be stabilized with as little as two implants in an arch. However, the more implants the more stable your denture, and the more natural-looking your denture can be made to look. With six to eight implants in an arch the pink plastic sides of the denture can be eliminated. This makes the denture teeth to look like they are emerging from your gum. It’s also possible to create an upper denture without a palate (covering of the roof of the mouth). Besides offering optimum support to keep your dentures stable, well-prepared implant-supported dentures factor into consideration the ideal bite and the function of the mouth. They also improve facial structure, giving you a mini “facelift” as the dentures plump the lips and face out. A dental bridge is made up of one or two prosthetic (false) teeth made out of porcelain, supported by crowned adjacent teeth. With implant-supported bridges, instead of using natural teeth to support the prosthetic teeth, implants are used. This is a very stable and successful substitute for missing teeth. Like a dental bridge, a fixed-implant denture can only be removed by your dentist. Unlike a dental bridge, the denture is created from acrylic and not porcelain teeth. This kind of denture works best in the lower jaw because of its design which allows cleaning underneath your denture. When you have many broken, worn or missing teeth, then a full mouth reconstruction may be required. 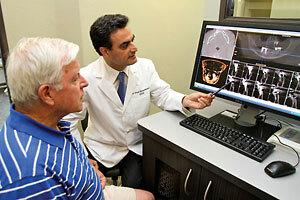 Our team is comprised of experience and respected doctors in their field. They possess the training, experience and expertise to perform the various advanced dental procedures required to create full mouth reconstructions that not only look fantastic but are also healthy, function properly and long lasting, too. Depending upon your situation, these procedures can include gum disease treatment to save teeth; dentures, crowns, bridges, veneers and dental implants. 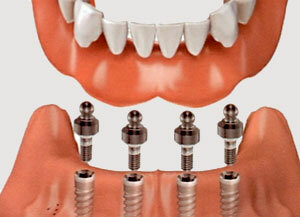 We use implants to anchor dentures or to create fixed bridges. When placing implants we use advanced computerized equipment to ensure stability and longevity as well as to make sure your teeth, muscles and jaws work together in harmony. Whatever procedures we use are the ones we believe are right for your situation. 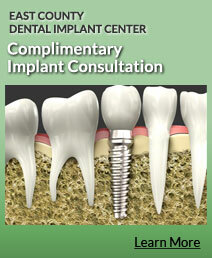 You won’t get an implant, or any other treatment unless you truly need them. Simply put, our main focus is on the overall health of our patients, smile aesthetics and the longevity of the work that we do. “I get lots of comments on my “beautiful smile”. My crowns and implants are 100% serviceable with no problems.